First of all, I swam a mile today!!!! Wooohooo! It’s not my first, but it’s been awhile since I’ve dedicated enough time and energy to attempt one, and I feel like I might be getting back on track exercise wise. Last week I started swimming with my friend A. here and it’s made all the difference. We swim at the same pace and I find myself so much more relaxed in the water (and thus able to swim a lot farther) with her as a partner. So yay, I’m excited! Swimming is so the best justification for cooking all the time. Another great justification for cooking all the time is the produce here. I know I’ve gushed about it in nearly every post, but I just can’t get over how local and fresh and organic and delicious and relatively affordable everything is. I spend all my money at market or at the co-op, true, but for me it’s all I spend money on. That and my membership to the YMCA so I can swim off the pounds. One of the foods I’ve been loving, and eating tons of, since moving here is the apples. Some are hit-or-miss, i.e. the Arkansas Black Apple, and some are just darn delicious like the Granny Smiths and the Golden Crisps. Some make great pies, some beg to be munched whole, some make great hiking companions, and some like to hang out in bowls of oatmeal. It all depends. Some, however, want to be made into apple butter. It’s surprising that I haven’t made apple butter before, given my addiction to it, but I’m never buying the stuff again now that I know how easy it is to make. My one complaint is that the texture isn’t quite right–the jar I’m working on now is a little gummy and hard. It tastes won-der-ful, and it does spread, but it takes a little work. Does that mean I overcooked it? This batch of apple butter was also my first attempt at canning, so I hope I did everything right (I sterilized the jars and lids and then sealed everything in a hot water bath), but time will tell, I suppose. Ladle apple mixture into a food mill and strain the mixture through, removing the seeds and peel. Measure resulting puree. Add 1/2 cup of sugar for each cup of apple pulp (approx. 8 cups). Stir to dissolve sugar. Add a dash of salt, and the cinnamon, ground cloves, allspice, lemon rind and juice. Taste and adjust seasonings if necessary. Cook uncovered in a large, wide, thick-bottomed pot (CP note: I used 2 large pots, and the cast iron one seemed to work a lot better than the stainless steel pot) on medium low heat, stirring constantly to prevent burning. Scrape the bottom of the pot while you stir to make sure a crust is not forming at the bottom. Cook until thick and smooth when a bit is spooned onto a cold plate and allowed to cool (1 to 2 hours). I can’t wait to make this, it looks delicious and perfect for a cozy fall morning. Thank you! Aaaah I love this!!! Jars of home made apple butter would make great holiday gifts, too! Looks delicious and I bet the house smelled amazing while it was cooking! mmm apple butter sounds great this time of year. OMG SEVEN pints of apple butter?!? you rock. i’ve been wanting to make some of this myself. maybe i will buy out someone’s apples at the farmer’s market one of these days and make some. You are making me so jealous – I really miss swimming. I remember when I swam my first mile. It was such an achievement. Just like that apple butter – looks phenomenal. Though I’m quite curious about this pumpkin butter idea! I got a pumpkin in the organic box today and that sounds like a potentially yummy use for it. You’re far more talented than we, I must say! Of course, you may have followed a recipe? i’m afraid to make fruit butter because i know it will lead to more bread consumption. lots more. You may have cooked it a little too long, but you did an outstanding job, especially for your first go at it! It looks wonderful and now I’m craving it. I feel like a giddy child looking at your apple butter…looks so scrumptious! I don’t think I’ve ever tried apple butter or any fruit butter for that matter. It looks great! I need to try this. 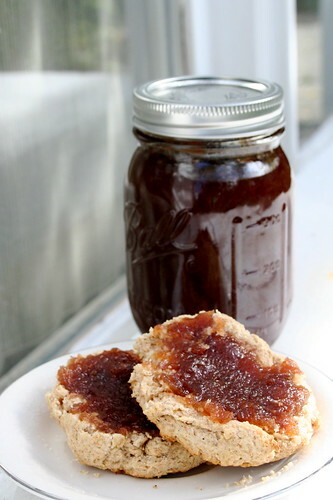 Homemade apple butter sounds like a million times better than what I can get in the stores. hooray for swimming a mile, Jes – that rocks some serious socks! doublew00t! that’s so awesome that you’ve got a friend to swim with! i hope some day to find a buddy to run with! yay! the golden crisps are super yum, and affordable fresh local organic awesomeness = the best! i’ve never made apple butter, so i’m not too sure if ya overcooked it or not, but i’m glad it’s super deeeelicious! fruits butters are so wonderful and really make fall that much more gloriously good! Apple butter is the best! It’s a great excuse to go apple picking and get tons of apples, and then the house smells lovely for hours after you cook them. I know! The more I learned about it, the less I desired to eat there. We had few options in my town. Homemade apple butter sounds delicious. I love the colour it has.